I’m so excited to share with y’all that the fabulous Kathy Morelli will be joining us on Monday evening at 8:30pm ET to talk about the upcoming Postpartum Support International Blog Hop for Postpartum Maternal Mental Health Awareness. Kathy is a tireless advocate and supporter for women in the birth realm. She does so much on both a professional and volunteer level that I wonder if she ever sleeps. In addition to her own counseling practice, she also runs BirthTouch®, volunteers for PSI, and founded the #MHON chat. This is in addition to every day life stuff. Like I said, I wonder if she sleeps! On Monday, Kathy and I will be chatting about the blog hop, but also about the importance of sharing your story, regardless of your station in life. It’s a tough decision to share your story but as both Kathy and I have discovered, it can also be a very empowering one. In a post about her upcoming guest spot on #PPDChat, she expresses how she struggled with the decision to share her struggles as a mom who fought postpartum depression. 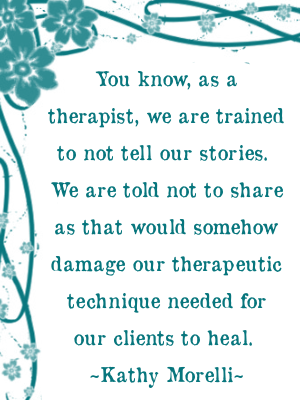 Because she’s a therapist, she says, they are trained not to share their stories. But she stepped out from the shadows and shared. For that, I am grateful, and I know several others are too. It’s such a relief to know we are not alone. I’m looking forward to Postpartum Support International’s Blog Hop for Maternal Mental Health Awareness in May. I’m really looking forward to kicking it off with a wonderful chat with Kathy at #PPDChat on Monday evening at 8:30pm ET! I hope to see you there!!! PS. 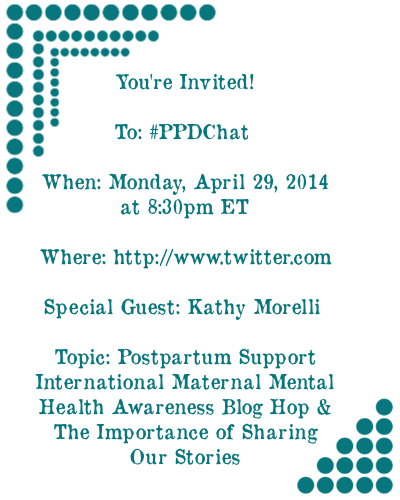 To share the announcement of Monday’s #PPDChat, feel free to post this graphic to your blog! This entry was posted in #PPDChat and tagged #PPDChat Guest, Kathy Morelli, Postpartum Support International Maternal Mental Health Awareness Blog Hop, Sharing our Stories on April 26, 2013 by LHale. Erika writes over at Psych Central and is a practicing mental health counselor. We occasionally chat about mental health issues. This week has been no different and I was glad when she asked me, after I posted something on Facebook, for permission to share it with her readers at Psych Central. I shared tips on how to take care of yourself after a tragic event, specifically in response to the events in Boston on Monday. Turns out they really apply to this entire week because it’s been a doozy. To read Erika’s article and get some really helpful tips on how to care for your emotions after a tragedy, go here. Thank you, Erika, for a wonderful piece, and for turning my struggles with Sandy into something meaningful. I sincerely hope it helps someone. This entry was posted in life, recovery time and tagged Boston marathon, mental health, self-care on April 18, 2013 by LHale. 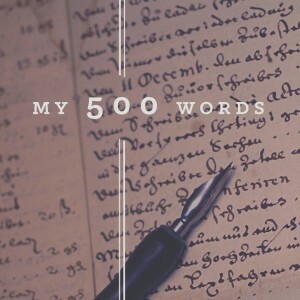 Today, I’m thrilled to have a guest post over on Mama’s Comfort Camp. Yael is an amazing woman, one I am honoured to call friend. When she asked me to write a post to help celebrate the birthday of Mama’s Comfort Camp, I immediately said yes. After a couple of scheduling snafus, the day is finally here. You can read “The New Village” here. Go. Read. And discover yet another amazing community of supportive Mamas on the Internet. We’re growing – and you are not alone in your journey along the path of Motherhood. Join us. About Yael: Yael Saar is a mama on a mission to remove guilt and shame from parenting in order to make room for joy and love. She is the Founder and Keeper of the Mama’s Comfort Camp, a Facebook community that functions as a safe haven and refueling station for hundreds of moms from around the world. This community is free and open to moms of kids of any age, and we share our laughter, tears, and triumphs, all the while normalizing our motherhood struggles and bridging the gap between expectations and reality in a uniquely judgment-free environment. This entry was posted in blogger, motherhood, strong woman and tagged guest post, Mama's Comfort Camp, Yael Saar on April 15, 2013 by LHale.